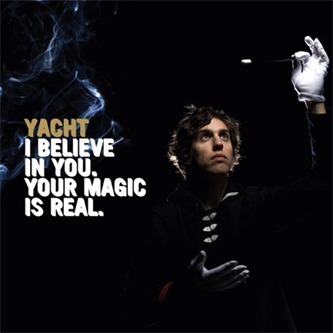 YACHT is Jona Bechtolt, a man who does production for the really rather good K Records act The Blow. Well, he used to before the duo split. but you get what I'm saying, he did the beats for the fabulous last album 'Paper Television', so you should know what kind of irreverent electronic indie pop to expect on this magic themed album. And yeah, I did say magic themed, the Cascadian curmudgeon can be seen on the cover of his latest full-length in full magic circle garb, Paul Daniels it seems would be proud, and as long as he keeps his hands of Debbie Mcgee he can probably count on one fan in the British Isles, but thankfully the music is actually pretty darned tootin' too. Rather than smoke and mirrors, Bechtolt concentrates his spiritual abilities to creating pop music somewhere in-between Timbaland and The Postal Service - sugary indie pop with a low end and a percussive rumble to get the R&B crowd on board. Of course this is likely making the past faces of the indie elite shiver in their neon socks, but for me there's nothing better than some genre-bending cross pollination and few do it better than Monsignor Bechtolt. Check the wonky Eats Tapes collaboration 'It's all the same Price' which I'd like to think it an ode to Britain's pound shops, or the electroid stomp of 'The Magic Beat' and you'll work out what this album is about - fun, pure and simple. So leave your expectations at the door, throw down your airs and graces, grab a pair of your best dancing shoes and lose the plot, David Blaine's already there and he told me he's having a pretty good time.